Energy and performance of parallel systems are an increasing concern for new large-scale systems. Research has been developed in response to this challenge aiming the manufacture of more energy efficient systems. 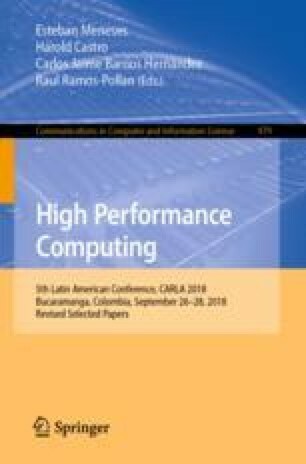 In this context, this paper proposes optimization methods to accelerate performance and increase energy efficiency of geophysics applications used in conjunction to algorithm and GPU memory characteristics. The optimizations we developed applied to Graphics Processing Units (GPU) algorithms for stencil applications achieve a performance improvement of up to 44.65% compared with the read-only version. The computational results have shown that the combination of use read-only memory, the Z-axis internalization and reuse of specific architecture registers allow increase the energy efficiency of up to 54.11% when shared memory was used and increase of up to 44.53% when read-only was used. This research has received funding from the EU H2020 Programme and from MCTI/RNP-Brazil under the HPC4E Project, grant agreement n.o 689772. It was also supported by Intel under the Modern Code project, and the PETROBRAS oil company under Ref. 2016/00133-9. We also thank to RICAP, partially funded by the Ibero-American Program of Science and Technology for Development (CYTED), Ref. 517RT0529.